I still can’t believe this is happening! 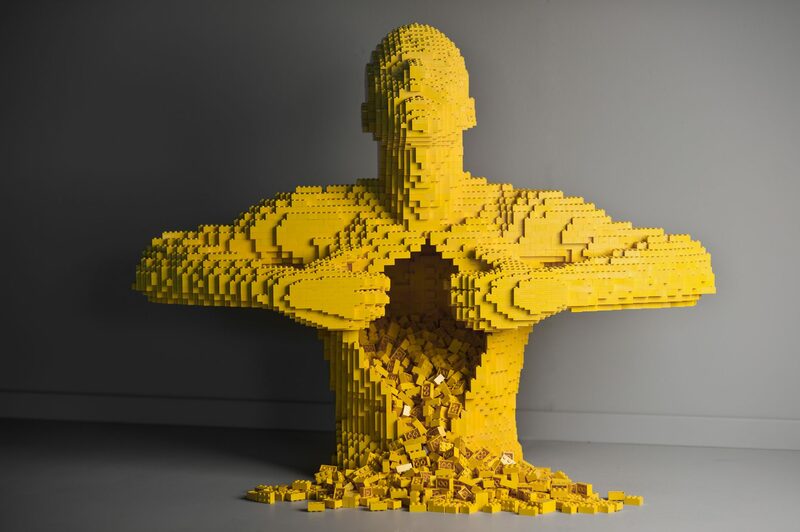 About a year ago I saw a cool LEGO sculpture on Twitter and discovered that the artist, Nathan Sawaya, used to be a corporate lawyer but decided to follow his passion and became a full time artist making sculptures from LEGO. I was captivated by his talent and here I am a year later sharing with you all my interview with this genius of a man! It really is a pinch me moment and yes, I love my life right now. In 2007 Nathan started his exhibition called, The Art of The Brick which tours around the world and has often broken attendance records. Last week I was privileged to attend Nathan’s current exhibition in London which celebrates DC Super Heroes like Superman, Wonder Woman and Batman, to name a few. It is an ahhhmazing exhibition and I haven’t stopped raving about it since I saw it. I actually got quite emotional as I walked through the exhibition; I was awed by Nathan’s talent, his courage to leave behind a ‘traditional job’ and his desire to inspire others to develop their own creativity. 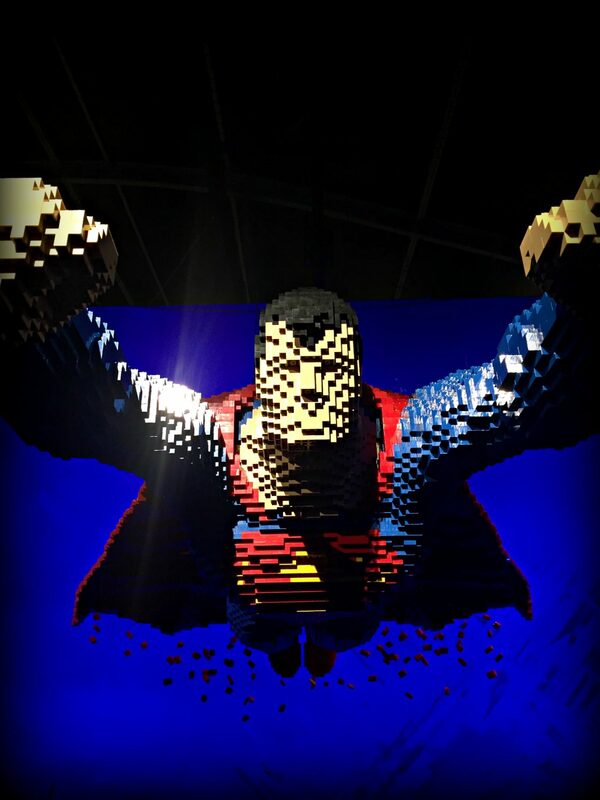 I can totally understand why CNN has rated The Art of the Brick as one of the top 10 must-see global exhibitions. I can also understand why Nathan’s sculptures are worth up to six figures – the level of painstaking detail and talent justifies this. In 2012 Nathan was ranked by Artnet as being the 8th most popular artist in the world. He is also the author of two bestselling books, and he has been commissioned to create works of art by people such as Bill Clinton and Lady Gaga. He truly is a LEGO master! 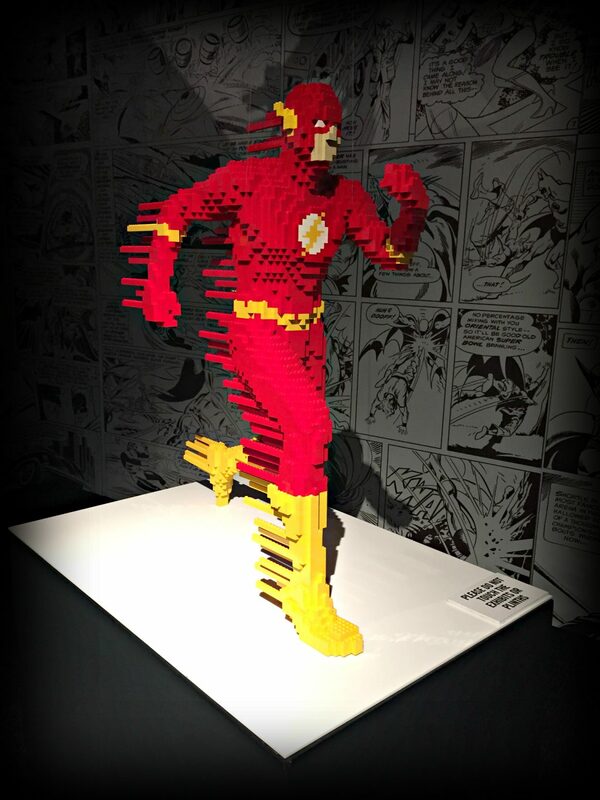 If you’re in London you must go and see The Art of the Brick: DC Super Heroes. 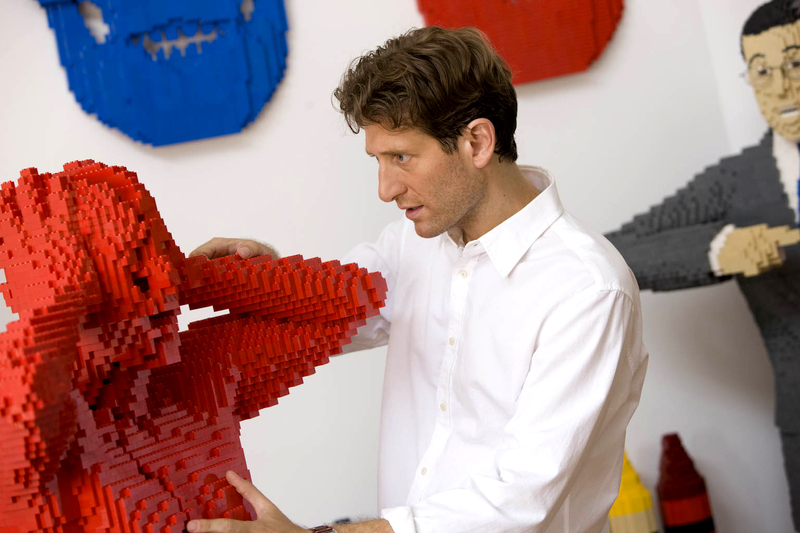 Also, read more about Nathan on his websites: The Art of The Brick and Nathan Sawaya; and follow him on social media via Instagram, Twitter, and Facebook. Keep reading below and be inspired! Nathan Sawaya. Photo courtesy of brickartist.com. 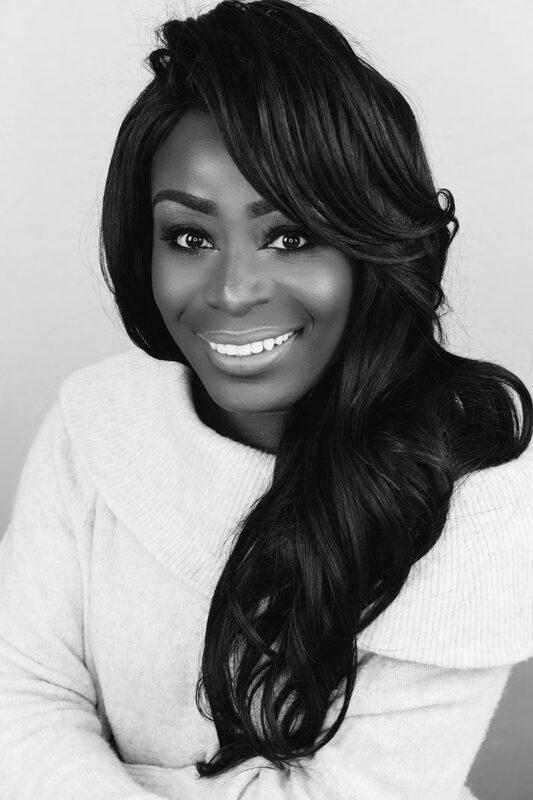 MSA: Why did you leave your job as a corporate lawyer? Did you envision how successful you would be as an artist? NATHAN: After I graduated from college, I did not have faith in my art for a full time career, so I became an attorney. When I was practicing law, I would come home from long days working at the firm in New York City, and I would need some sort of outlet. Some people go to the gym at the end of their day, but I found I needed a creative outlet. So I would draw or paint or write. Sometimes I even sculpted. And it was one day that I challenged myself to sculpt using this toy from my childhood. So I started experimenting with LEGO as an art medium. I put together a collection of sculptures and a website to showcase my own virtual gallery. Eventually I was getting commissioned to create works of art. And the day my website crashed from too many hits, I decided to make a change in my life. I left my day job behind to become a full time working artist. MSA: Well done for having the courage to break with tradition and follow your heart! So what is it about LEGO that captivates you? NATHAN: There is something amazing about LEGO bricks when used to sculpt large forms because up close the viewer is looking at tiny rectangles full of sharp corners and right angles. But then, when the viewer steps back, all those corners blend together and the sculpture’s shape comes into view. The right angles become curves, and instead of distinct lines, the viewer sees a human figure. As in life, it is all about perspective. That is why I like sculpting with LEGO. I also like using LEGO bricks because when used as a medium it makes the art very accessible. 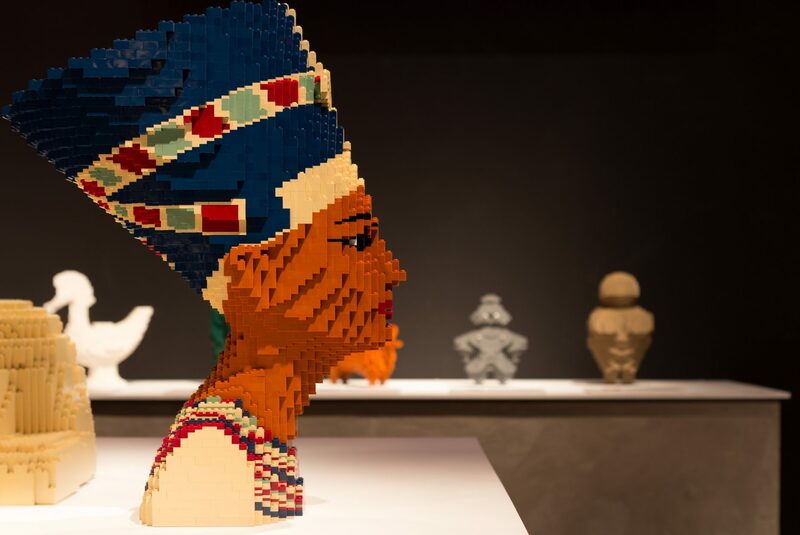 Families who may have never been to an art gallery are drawn to The Art of the Brick because of that familiarity with the toy. “Yellow” by artist Nathan Sawaya. Photo courtesy of brickartist.com. MSA: You have been quoted as saying, “Art is not optional,” please explain what you mean by this? NATHAN: Overall, my role as an artist is to inspire. Throughout my own personal journey, I have learned that art is not optional. It’s not a nice to have, it’s a must have. When I was an attorney, I wasn’t happy, but creating art made me happy and I eventually changed my career to focus on making art. I’m not the only one who is positively impacted by exercising creativity. It has been proven time and time again that students do better in schools when they are exposed to art. Higher test scores and graduation rates when art is part of the curriculum. And creating art is often used in many types of therapy and recovery. Creating art makes you happier. Creating art makes you smarter. Creating art makes you healthier. Clearly, creating art makes you a better person. I want to inspire people to make art, so that they make a better world. Lofty? Sure, I know, but why not? “Dinosaur Skeleton” by artist Nathan Sawaya. Photo courtesy of brickartist.com. MSA: Exactly! Why not? The world needs smarter, happier and healthier people. You have exhibitions around the world, you own 2 studios in Los Angeles and New York City, and you are commissioned by people to produce artwork. I’m interested to know what a week in your life looks like? NATHAN: There is no typical week, but generally I find myself working in my art studio creating a new sculpture. The creation of the sculptures does take time and of course it all starts with the idea. The idea is the key component in developing the art. And the idea must be inspired. Inspiration is a tough thing to define, because it can come from different places. Fortunately, having multiple art exhibitions touring the globe, I get to travel around the world a lot. I get to meet different people, go to different locations and experience different cultures. And I use those moments for inspiration. I carry a sketch pad to jot down ideas as I go. When I do find inspiration for a new work of art, I am excited but the next step is planning. I like to plan out the sculpture as much as possible. I want to be able to visualize the final piece before I put down that first brick. As I am building I do glue each brick together. Because we ship artwork all over the world, I found that it is important to glue all of the bricks together to survive the shipping process. Now because I am gluing the bricks, that means that I sometimes have to use a chisel and hammer to break the bricks apart if I make a mistake. This can make for a slow process. When I am working on a sculpture I spend 10-12 hours a day in my art studio. A life size human form sculpture can take me up to 2-3 weeks. When I finally complete a sculpture, I feel that same excitement that I did at first when I had the initial idea. But that quickly turns to thoughts about the next project. MSA: Wow! I’m interested to know what has been the biggest highlight of your career so far? And what has been your lowest point? 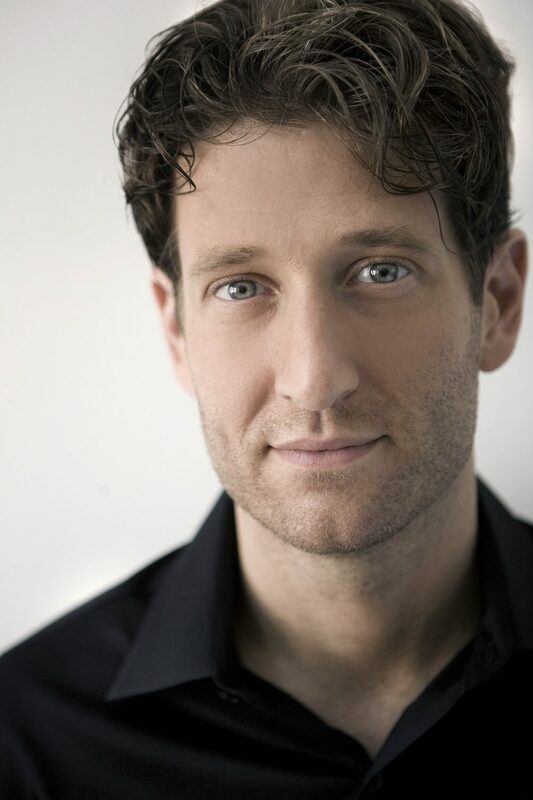 NATHAN: My lowest point might have been when I was unhappy working as an attorney. But I don’t know if I can pick just one moment as my biggest highlight. I have found my passion and I am following my dreams. As an artist I have been able to travel the globe and meet folks from all walks of life. If I had stayed a lawyer, I don’t know if I would have got to do such amazing things as be a part of the Academy Awards, or be invited to the White House, or meet royalty, or even work with Lady Gaga. Overall, the worst day as an artist is still better than the best day as a lawyer. “Image IMG_6256” by artist Nathan Sawaya. Photo courtesy of brickartist.com. 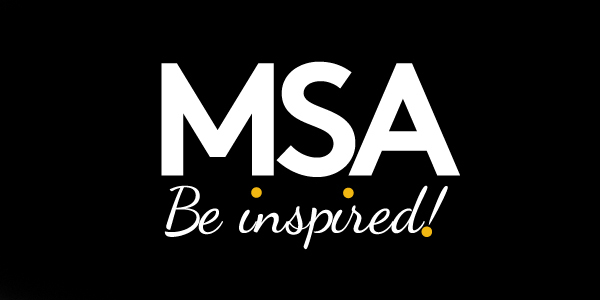 MSA: What advice would you give to someone who has a creative passion but doesn’t know how to turn it into a business? 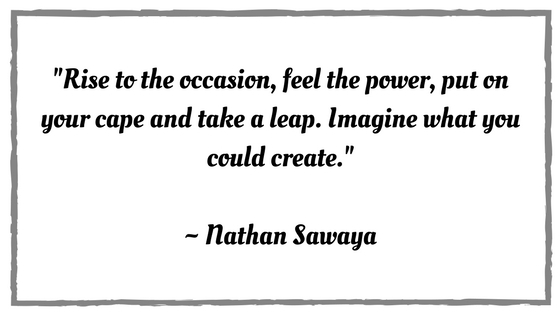 NATHAN: If you have found your creative passion and feel that you can turn it into a successful business, you need to take the time to plan your next moves. I spent years figuring out my plan before I took the leap. So if you want to quit your 9 to 5 day job and become a rock star, be sure you have taken the time to learn how to play the guitar. MSA: Well said! Planning is key to achieving success. Thanks a billion for taking the time to answer my questions! I deeply appreciate it. “Working in the Studio” by artist Nathan Sawaya. Photo courtesy of brickartist.com. Words cannot express my appreciation for the gift Nathan Sawaya has given to the world. He decided to listen to the fact that being creative brought him joy. Despite the doubts of others, he had the courage to leave behind a ‘secure’ job and follow his passion. He works incredibly hard for weeks on end to produce amazing works of art that inspire people around the globe. Wow! The world would have been duller if Nathan hadn’t taken steps to keep on pursuing what he loved. 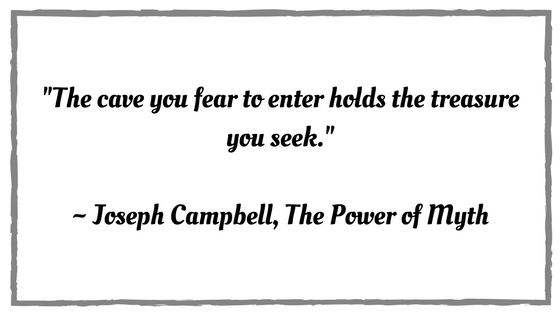 So take a page out of his book, explore what it is that you LOVE and pursue it relentlessly. Previous Post MY BLOG’S FIRST BIRTHDAY! Thanks so much Clem. I really appreciate the comment! Glad you enjoyed this. Page taken, framed and placed in a spot on the top shelf of my mind for quick reference! We need to read such stories on a regular basis to remain fired up and inspired. Thank you for sharing this; Please keep them coming! Wow! !